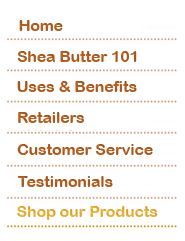 All natural, organic raw African Shea Butter with no additives. It has not been refined or processed with chemicals. 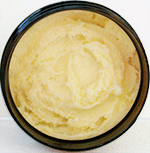 This unprocessed, fresh Organic Shea Butter is extremely rich in Vitamins A, E and F. It can be used on the entire body as a skin and hair moisturizer or as an intensive treatment for dry, damaged, and aging skin. It is excellent for rough skin, blemishes, eczema, sunburn, stretch marks, scars and wrinkles. Use daily for soft, smooth, and healthy skin. Non-greasy and does not clog pores. Suitable for sensitive skin. To use: rub a small amount in palm of hands before applying to skin or hair. It is quickly absorbed by all skin types, and is also suitable for sensitive skin. Ingredients: Contains only 100% Pure Organic Shea Butter.